a compact and sealless pump, where the power from the motor is transmitted to the centrifugal impeller by means of a magnetic coupling. The wetted components are non-metallic injection moulded thermoplastics PP-GF or PVDF. The pumps handle many types of low and normal viscous clean liquids such as chemical aggressive and toxic ones. 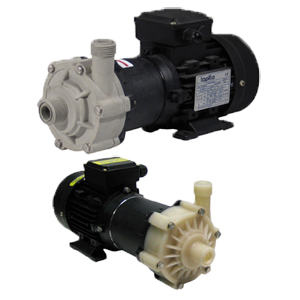 Sealless pumps ideal for hazardous fluids, commonly used transfer, filtering and circulation application.